Below is a fine example of how the Little India series that resulted in the fresh debate with Academician Paul Courtright inspired the hindu community to get involved to attend & refute his & other panelists inaccurate & possibly motivated characterization of Hinduism. 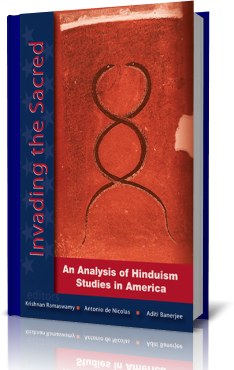 The Little India debate, of course, was between Paul Courtright & the Editors of the book “Invading The Sacred”. It was a result of the book, needless to say. Only six days prior to the event, we got word of the Rudolph C Barnes Sr. Symposium to be held at the University Of South Carolina School Of Law, on Jan 26th, 2008. There were two panels on Religion and Social Views — one on Islam and the other on Hinduism. We were shocked to find the name or Dr. Paul Courtright in the list of panelists on Hinduism. One of our Board Members got in touch with the organizers to request that a practicing Hindu be included on the panel. After deliberating with them, our Board Chairman Mrs. Arunima Sinha was allowed to present. She was the only Hindu on the panel that was going to talk on `Hinduism and Social Views’! In order to prepare for this, our temple representatives read the articles about Courtrlght’s Hinduphobia that appeared in `Little India,’ an Indian magazine in the U.S. Upon attending the event we found that in the case of the Islam panel, all except one of the panelists were practicing Muslims in academics. The impression they gave was that Islam is a moderate and progressive religion. On the Hinduism panel, Paul Courtright was the first to speak; he didn’t say anything negative, but was very shaky. Later we came to know that he was warned by the organizers that there would be members of the Hindu community in the audience, so he had to be careful. He basically talked about how non-Hindus mainly learn about Hinduism from classes in academia, and Hindus learn most basics of Hinduism from their homes. The next speaker was Professor Timothy Lubin. He spoke about the origin or Hindutva forces (most notably the BJP). While pretending to be neutral, he was cleverly presenting half truths in such a way that an average American listener would have walked away thinking that Hindutva/BJP’ group are a nasty bunch. He mentioned something about the coining of the word Hindutva by Veer Savarkar, and described RSS as being similar to the Nazis. He described Hindus most of the time as “Hindu Nationalists.” For instance, he said that the Hindu nationalists perceive the Muslim population to be rising rapidly, without mentioning them that it was an alarm based on facts. He also talked about BJP demanding the abolition of article 370 (which is false!). He didn’t mention that the Hindus had been driven out of Kashmir and were living like refugees in Jammu and places outside Kashmir. He didn’t mention that while Hindu population was declining everywhere in India, Pakistan and Bangladesh, the Muslim population in the subcontinent had increased two fold by increasing size family size and by illegal immigrants from Bangladesh. It seemed that he had written a lot of such nonsense in his notes. But for want of time and the presence of potential ‘trouble makers’ from the local Hindu community, he cut down his presentation. The next speaker was Mrs Arunima Sinha who is the Chairman of the Board of Trustees of the Hindu Temple of Columbia, SC. She started with the prayer ‘Asato Maa Sat Gamaya… as she always does. But she was in a difficult position, because they gave her very little time (only 10 minutes) to refute the comments of Dr. Lubin, while the other speakers were given about 15 minutes each. She said that she did not agree with most of what Professor Lubin had talked about. She also took pains to mention that BJP/RSS/Hindutva was not the entirety of Hindus, and that India has always welcomed many outsiders with open arms. She said that Hinduism was the soul of India and was responsible for the broad and liberal outlook of most Hindus in India and abroad. She was constantly interrupted by the moderator, Dr. Hal French, who appeared very nervous and fidgety. He was blatantly unfair. She wanted enough time to counter Dr. Lubin point by point, but was abruptly asked to wrap up. She was clearly unsatisfied. Dr. Thomas Thangarajan spoke next, focusing mainly on the early history of Christianity in India. He didn’t say anything bad about Hinduism. He did mention that a lot of forcible conversion could change the demography and could cause trouble among the converted and non converted folks. It seemed that he had a Gripe about a number of evangelists coming from the West seeking converts among local Indian populace. His presentation also was cut short by the moderator. The moderator allowed only about a minute for questions. A couple of persons were allowed to ask questions. One Hindu stood up and talked about the attitude of Muslims toward family planning and that they were growing in number at a rate greater than any other minority in India and that it was indeed a cause for alarm. In response to this, Dr. Lubin went on the defensive and said he did not mean to say that there were no legitimate problems as claimed by “right wing Hindutva forces”, but that they were not justified in raising such an alarm. By then the moderator decided to cut short the whole session and announced break for coffee. A prominent member among the Hindus spoke loudly that the next time this kind of symposium was held, they should invite speakers who understand Hinduism and those who feel for the Hindus. “No blood has been shed for religion in India except by its invaders. Intolerance came with Islam and Christianity; the Moslems proposed to buy Paradise with the blood of “infidels” and the Portuguese, when they captured Goa, introduced the Inquisition into India. After reading this out, the questioner asked Dr. Lubin if it wasn’t so and how he could blame the Hindus from feeling a sense of oppression. Lubin said that Will Durant was wrong, and that vicious religious conflicts had existed in the past between Jains and Hindus long before the Muslim and Christian invaders. He clearly betrayed his disdain for Hinduism. One of the Hindus asked Dr Lubin Why Western academic scholars of Hinduism Aver mention the contributions made by Hindus to the world. For example, well before Galileo, Copernicus and Kepler, Aryabhatta and Varahamihira revealed the planetary system, days in a year, seasons etc, and none of it is ever taught in the universities. Similarly, Sushruta who happens to be father of surgery was never given his deserved place in medicine. Dr Lubin just did not have an answer. A couple of’ other Hindus also started to question him, but he left to attend the next session. The whole event was a lesson for us. We could see first hand how universities and academic forums are used to discredit Hindus and Hinduism. We could have done much better if we had known about the event sooner. We could have invited distinguished Hindu scholars to present our perspective. But still we all came away with the satisfaction that we had curtailed some of the speakers by our mere presence.